South Dublin members on the Louth coach outing at Soldier's Point. Picture by Bill Rea. 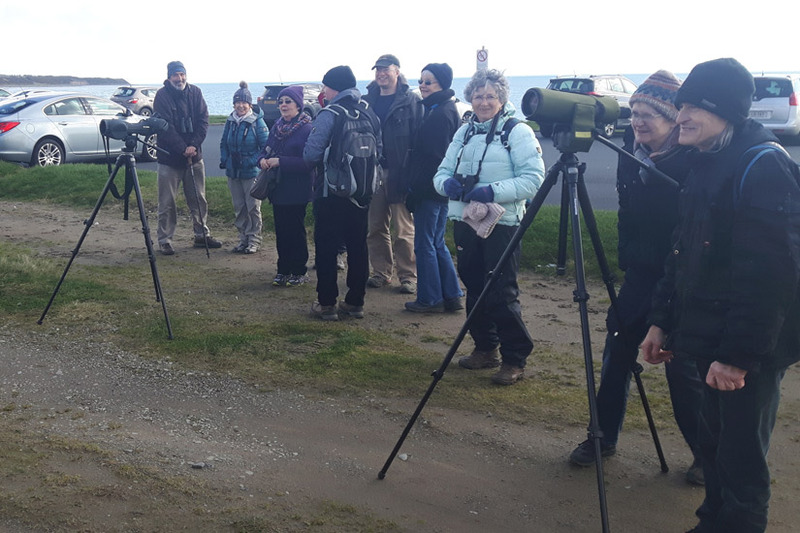 On a beautiful spring morning, 24 members of the South Dublin Branch of BirdWatch Ireland set out by coach for a birding feast in County Louth. This area has always delivered on previous trips so we travelled in expectation, and were not disappointed. Our first target was a flock of Waxwing which had been present around Dundalk all week but sadly not a trace of them on the day. Onward then to the docks area, where the rivers Castletown and Flurry enter the sea and is an area of rich estuarine mudflats. The tide was rising and had covered almost all the mud. However there was plenty to be seen for the sharp eyes and Teal, Little Egret and Greenshank were present. A Spotted Redshank stood out; clearly it is a regular find in the docks area as we encountered one before on a previous outing. A Buzzard did a super close and accommodatingly low fly-over, quite a spectacle. 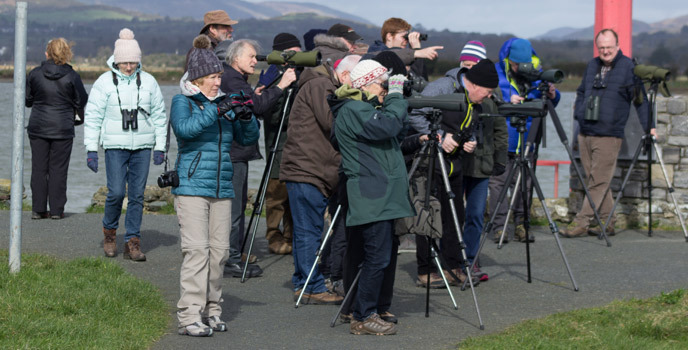 Pat Twomey with his 'super scope' picked up a lone Grey Plover almost hidden in a nook on a mud-bank. A Song Thrush was singing in full throat nearby but I failed to locate it so just enjoyed the sound. 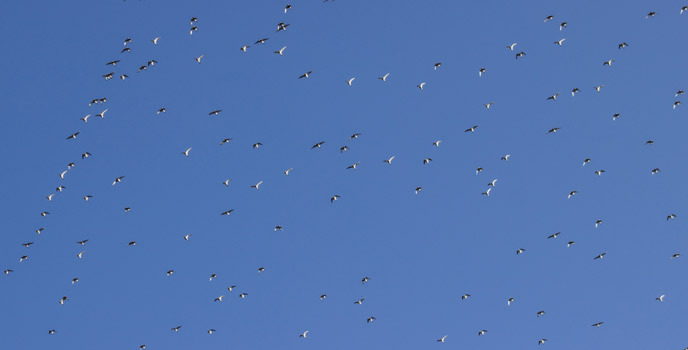 Some of the large flock of Golden Plover viewed from Soldier's Point. Picture by Bill Rea. We decided to head for Soldier's Point and revisit the docks when tide had ebbed a little. It proved to be a good decision. As we walked to the riverbank some small birds popped up for us, including, Stonechat, Skylark, House Sparrow and Blackbird. 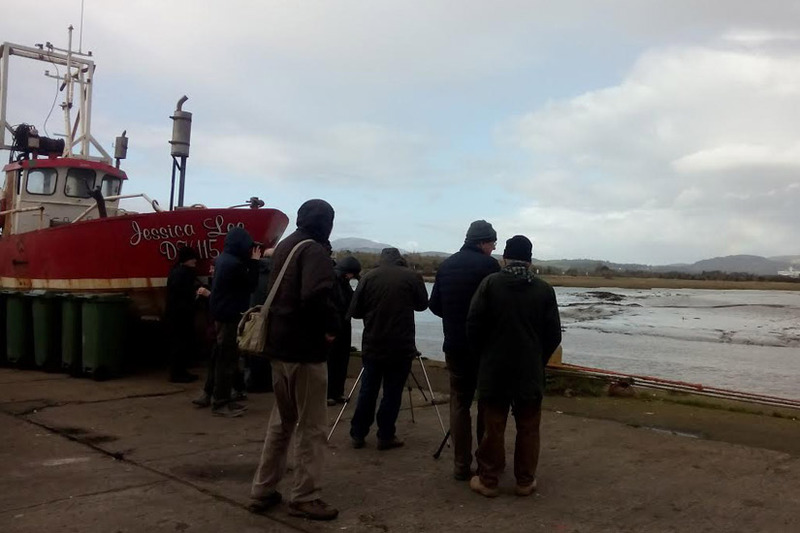 Arriving at the waters edge Niall had spotted a Female Hen Harrier being mobbed and we had super views of it all until she flew out of sight. 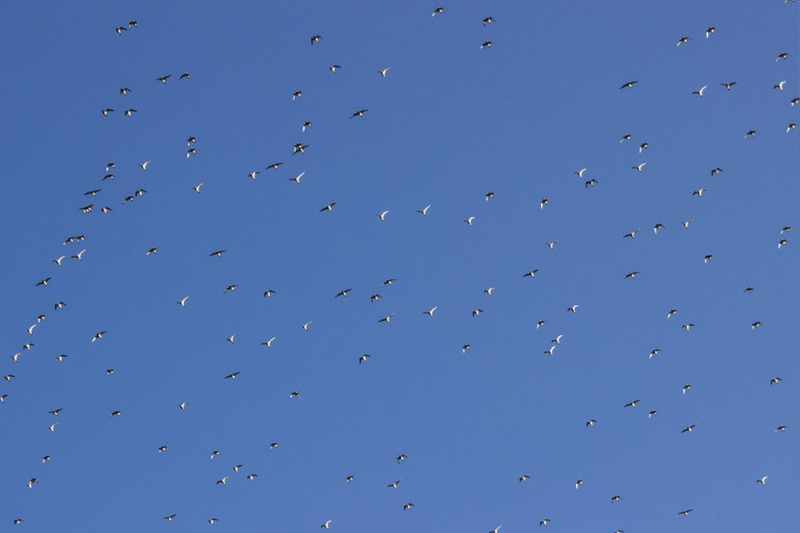 While looking skyward we noticed very high up an enormous flock of what turned out to be Golden Plover. They entertained us with their wheeling and swooping flight and eventually came closer so we could see them better. A pair of Red-breasted Mergansers appeared down stream busily diving and reappearing. 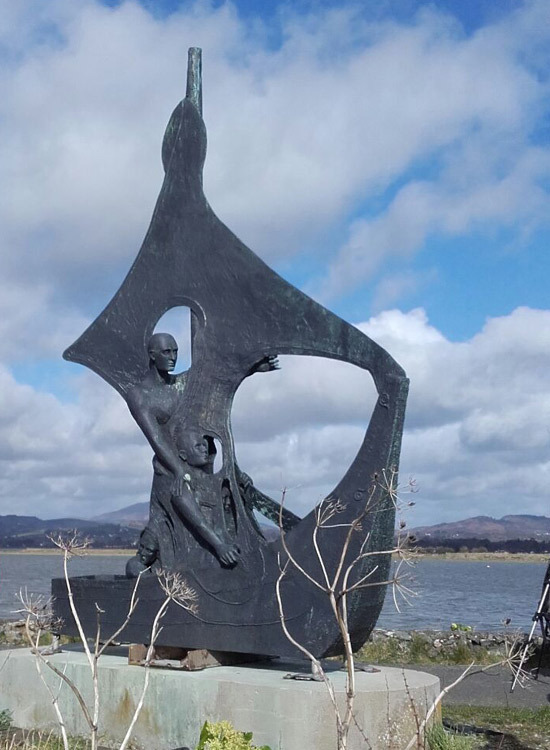 There is an intriguing Sculpture at the point entitled 'Manannán & The Voyagers' by Ann Meldon Hugh and Angela Mason took the picture of it. From there we headed north to Giles Quay. Twite were now on our minds having had reports of them there in the previous week. First we had a good number of Red-throated Divers with some sporting summer plumage. A small flock of roosting Dunlin produced some Sanderling on closer inspection. 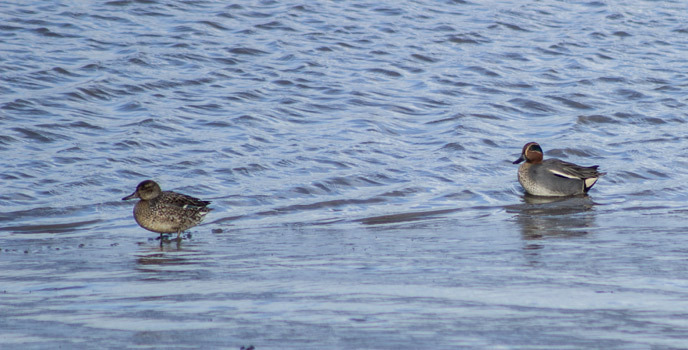 Two Common Scoter, were quite far off shore and did not oblige by coming closer. A few sightings of Great Northern Diver and a majestic Great Crested Grebe were a delight. 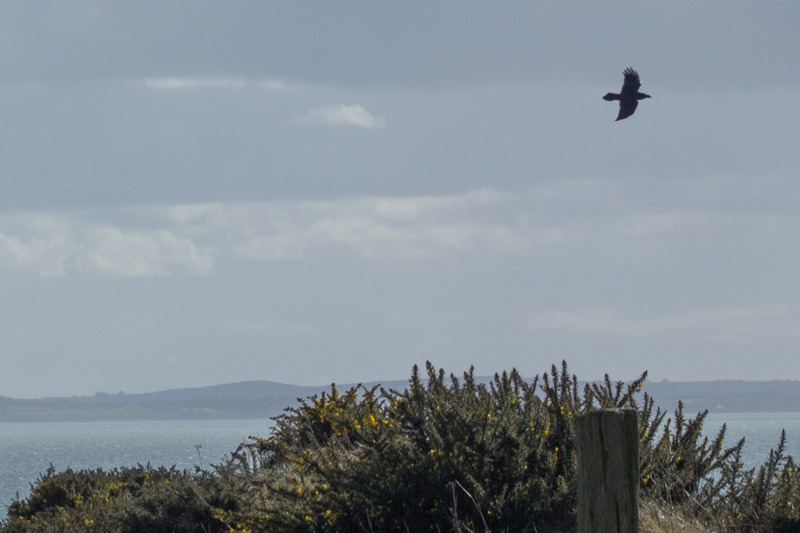 A Raven fly pass at Giles Quay. Picture by Bill Rea. We headed towards what looked like “Twite habitat” a walk of a kilometre or so. Getting closer Niall spotted a flock of finches landing on a bank of scrub and gorse with some trees. We got as close as we could until blocked by a fast flowing stream. The finches now were nowhere to be seen. Whilst waiting a lone Sand Martin flew circles around us. We were not expecting that. It proved to be one of many that arrived in Ireland, earlier than expected that day. We also had a brief glimpse of a Grey Wagtail. Some gulls close by were Common, Black-headed and a Great Black-backed. We had just decided on a deadline of three minutes more for the finch flock to reappear when they came bouncing along and flew into the bank opposite to us. They proved very flighty and did not rest much. Some flew down closer sat on bare gorse branches and under close scrutiny… and yes.. it delivered some Twite amongst the Linnet. It helped that many Linnet were showing pinkish fronts so could be overlooked. 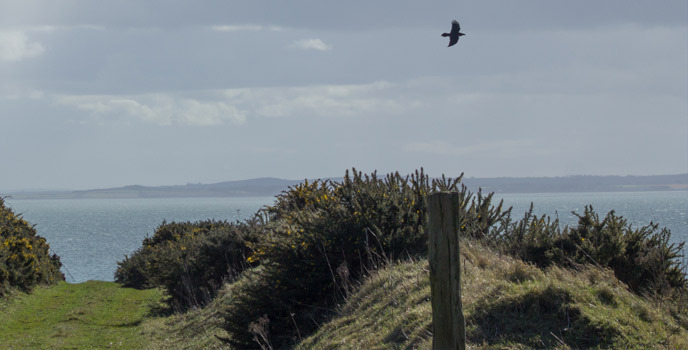 We got some good views, though a tough job to keep re-finding them as they relocated many times in the gorse bushes. However the persistence paid off for those who did stay. It was a first Twite sighting, for many in the group. 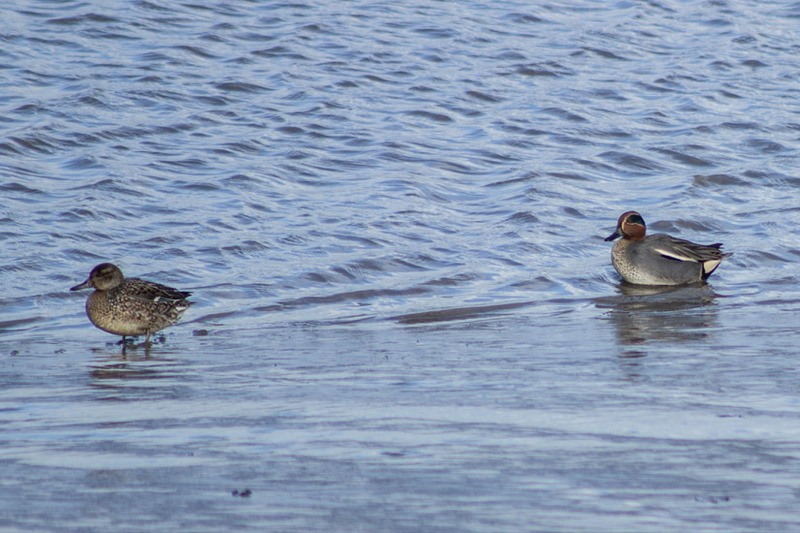 A pair of Teal at Lurgangreen. Picture by Bill Rea. 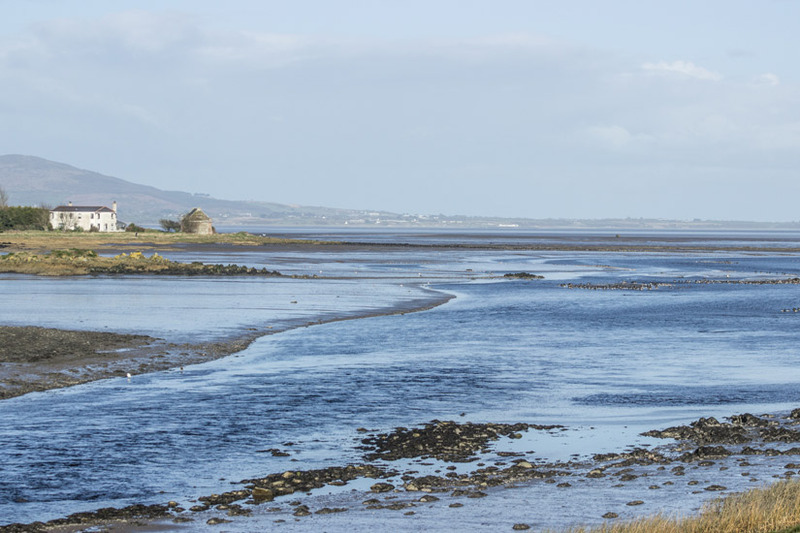 After our delayed picnic lunch we drove back to Dundalk Docks where there was a vast area of mudflat visible. The Spotted Redshank was still in the area wading through the water in its particular way. 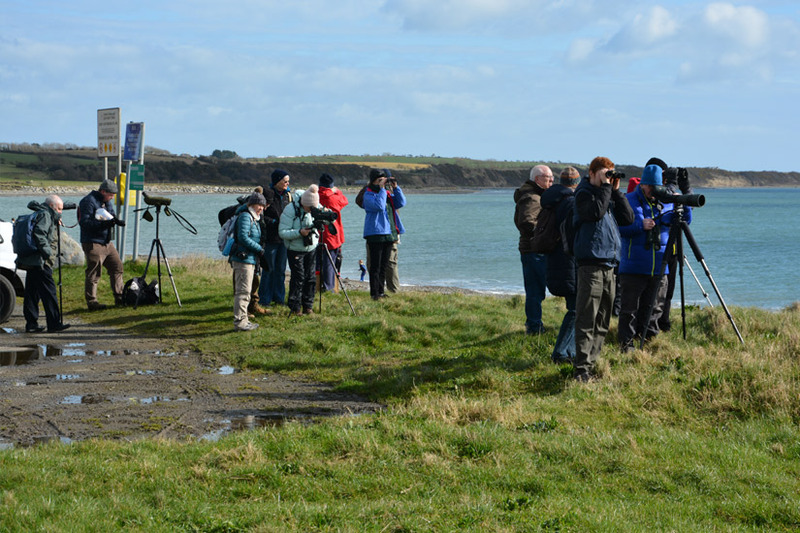 A Peregrine flew over as the bus arrived and a few people got a look at it. One Wigeon looked like it was sitting and hiding on a shelf of mud. Still no luck with sighting Ruff so onwards to Lurgangreen for our last birding stop of the day. 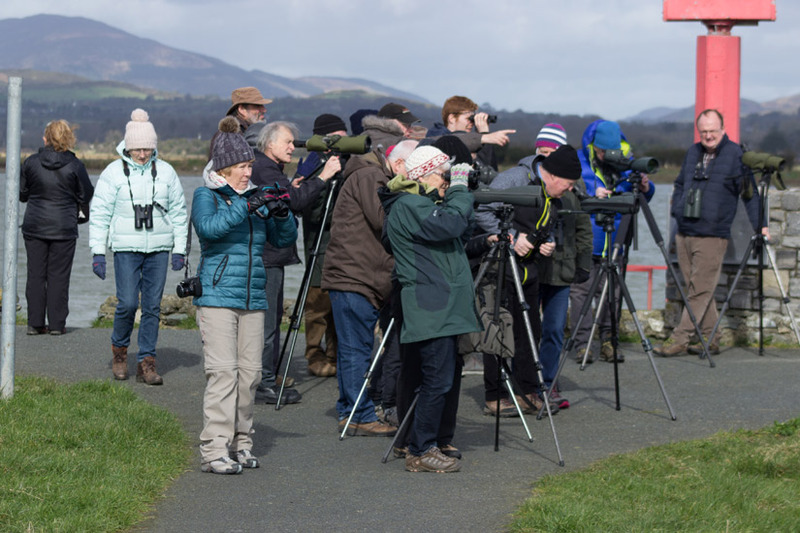 At Lurgangreen the tide was well out and we could see lots of waders on the shore as we walked to the Oscar Merne Hide. It was not long before we found some ten or more Ruff amongst the huge numbers of Redshank. Such a beautiful wader with very distinct bronze /black plumage a small head and short bill and upright appearance as it moves about. In the distance a large goose flock was seen and were identified as Pink-footed Geese, 97 in all. It is very large flock of these geese as they are usually found in much smaller groups. A little further on were a mixed group of Greylag and White-fronted Geese the latter probably on the journey back to breeding grounds in Greenland. Small families of Brent Geese were seen all along the coast all day but at Lurgangreen there was a large gathering on the shore. 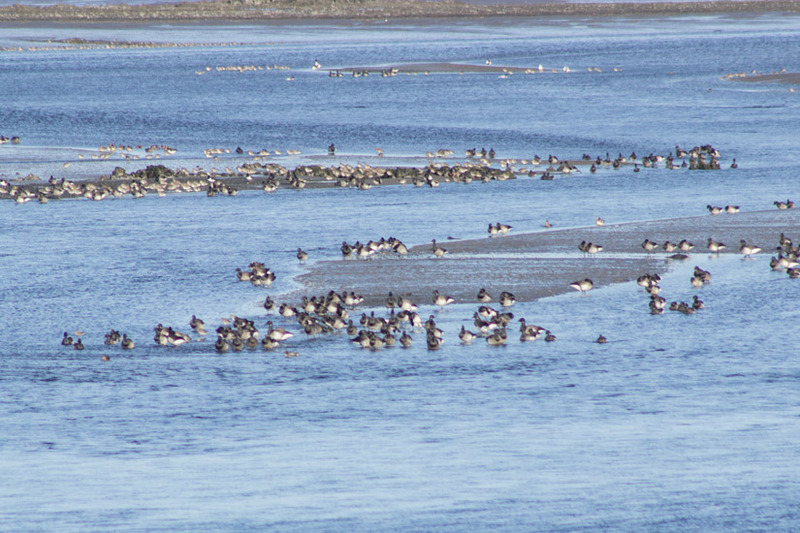 Many Teal, Wigeon and some Shoveler were in the river inlet. The Golder Plover we saw earlier were now roosting on the mudflats and a sprinkling of them in summer plumage reminiscent of 'high court judges' in court garb. 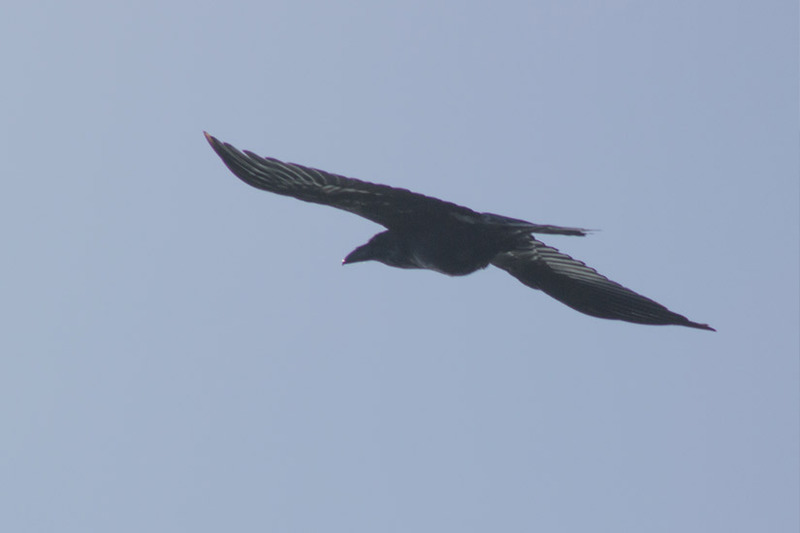 Black Raven against a blue sky at Giles Quay. Picture by Bill Rea. Some more pictures taken on the day by Bill Rea, Eleanor Keane, Ronan Browne and Angela Mason. Wildfowl at Lurgangreen. Picture by Bill Rea. South Dublin members at Giles Quay. Picture by Eleanor Keane. South Dublin members at Soldier's Point. Picture by Ronan Browne. South Dublin members at Dundalk docks. Picture by Angela Mason. 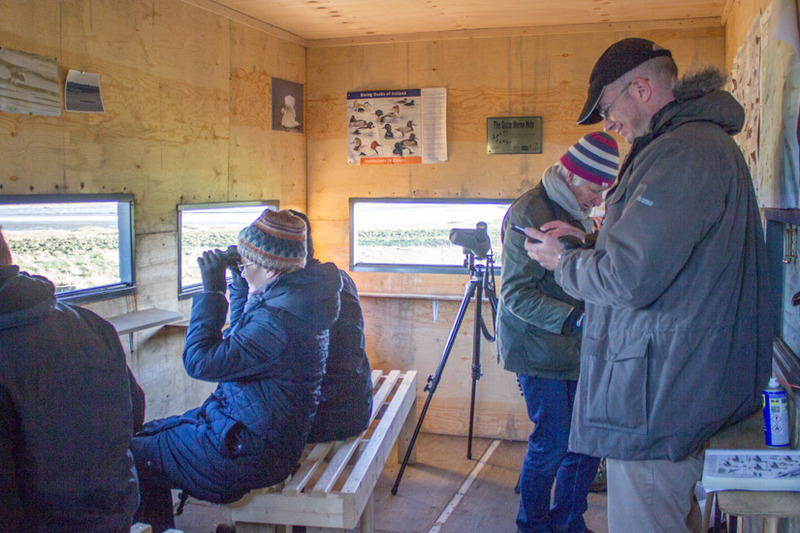 Inside the Oscar Merne hide at Lurgangreen. Picture by Bill Rea. The view from the Oscar Merne over Lurgangreen and Dundalk Bay. Picture by Bill Rea. Manannán & The Voyagers at Soldier's Point. Picture by Angela Mason. We had disturbed some Mistle Thrush in a field as we arrived and there was a Greenfinch calling in one of the gardens on the access road, as well the usual Robin, Wren and Dunnock. Here on past trips Yellowhammer and Tree Sparrow were a regular feature but not so this time. Light was fading fast but it was well after 5pm so we called it a day and headed back to Dun Laoghaire. On the trip back we called the log and the tally for the day was 73 species.